A few years ago Don Bailey published his book Cliffside, N.C., The First 50 Years. 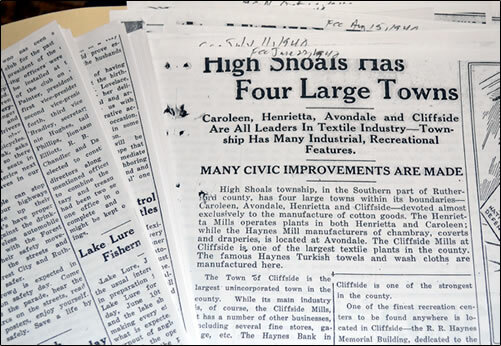 In his exhaustive five-year research into our town’s history, his sources included other histories and journals, the Cone Mills collection at UNC-Chapel Hill, personal interviews and old area newspapers. For our own research—and for posterity, a few months ago our society members had considered purchasing, from the NC Archives in Raleigh, microfilmed copies of the Forest City Courier from 1920 through the early 1980’s, contained on 99 reels of film. Then, the plan was, to have the microfilm digitized, so that every frame of the film (each a page from the Courier) would become a ‘picture’ that could be viewed by anyone on a computer. All this would cost about $2,500. Then work would begin, a lot of work, to find and isolate the files (pages) that made reference to Cliffside. There would have been about 50,000 pages to screen for pertinent material, and a lot of file management to be done, to make it all usable. Sometime earlier I had asked Don (who lives in Etowah, west of Hendersonville) if he had saved any of his research material, particularly printouts of old news stories. He had, in fact, saved lots of pages, and he would, sometime, get them to me (in Charlotte). Fortunately, before the society signed off on the plan, Don personally delivered his material. I had envisioned a couple of laundry baskets in which he had casually tossed the pages in a helter-skelter fashion. We were astounded to see what he brought: two “banker’s boxes” packed with fat folders, one for each year from 1900 to 1959, with the pages sorted by date. Everything remarkably neat and eminently readable and scan-able. The pages were from the Rutherford County News, the Rutherford Sun, as well as the Courier, and even some stories from the Charlotte Observer. Here’s how he had obtained them: Going to one of the few institutions that had the Courier microfilm collection, such as Isothermal Community College’s main library, or the Old Tryon Genealogical Society in Forest City, Don would load up a particular reel and start cranking. Scanning each page for “Cliffside,” he would stop on a suitable frame, adjust the viewer to display the desired story, insert a dime into the machine, and send the selected area of the screen to a printer. In the boxes he delivered (and donated to the society) there were exactly 1,240 pages. We know, because we scanned them. Don estimates he spent about $1,000 on the printouts. So he spared us the expense and effort we would have had to incur, for the years up to 1960. 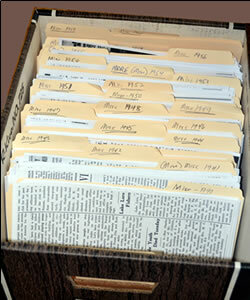 After we digest and catalog Don’s material, we’ll get around to dealing with the 1960’s and 70’s. In the meantime, in the Chimes and on Remember Cliffside, you’ll be seeing stories and facts from earlier years. For this issue we’ve chosen at random that wonderful year 1920. The average life span was 54 years, today it’s about 77. In 1920 Cliffside had no paved streets and mule-drawn scrapers would occasionally flatten out their ruts and bumps. Most states had few paved roads, mostly in cities. The Good Roads Movement was just emerging. Drivers who often mired up to their axles in bad-weather loblollies were beginning to pressure their politicians for action. North Carolina’s governor was Monroe native Thomas Walter Bickett, a Democrat. The Yankees acquired Babe Ruth from the Red Sox for $125,000. In the Fall election Republican Warren G. Harding was elected U.S. President to succeed Woodrow Wilson . A long dry decade began as Prohibition took effect. In January the U.S. Senate votes against joining the League of Nations. In March it refused to ratify the Treaty of Versailles. In June, the U.S. Post Office Department ruled that children cannot be sent via parcel post. In August the Nineteenth Amendment to the U.S. Constitution is passed guaranteeing the right of women to vote. On Sept. 16 a bomb in a horse wagon explodes in front of the J.P. Morgan Building in New York City killing 38 and injuring 400. On Sept. 29 The first domestic radio sets came to stores in the United States; a Westinghouse radio cost $10. These are just some of the well-knowns who were born in 1920: Tony Randall, Walter Matthau, Jack Webb, Denver Pyle, Peggy Lee, Bill Cullen, Helen O’Connell, Maureen O’Hara, Shelly Winters, Arthur Haley, Ray Bradbury, Mickey Rooney, Yul Brenner, Mario Puzo, Stan Musial, Virginia Mayo and Dave Brubeck. For a number of years the Cliffside Renown Band has serenaded the town about four o’clock a.m. on Christmas morning, and although it was very cold last Thursday morning the full band was out on time playing appropriate music. When the serenade was over and all returned to the hall a pleasant surprise awaited the boys. It was all planned by the efficient instructor Mr. D.C. Cole. When the boys marched into the hall they found that something had been going on there while they were out playing. Mrs. Griffin, sister of Mr. Cole had prepared oysters and coffee. It is needless to say that this was highly appreciated by the entire band. Mr. D.C. Cole began work Monday morning in the grocery department of the Cliffside Mills Store. Mr. R.Z. Dedmond has another new car and is ready to “take you and bring you back,” for it is a Ford. Two rooms of the library building are being remodeled for an up-to-date studio to be operated by Messrs. W.E. Hames and J.T. Gilbert. Both these men are proficient in the photography. Several more bungalows are being constructed which adds much to the appearance of the town. Other improvements have been made recently, among them is the work of Mr. G. Loveling, a native of Belgium, now located at Pacolet, S.C. Mr. Loveling has been in the landscape gardening business for about thirty-six years. He has transformed a number of odd nooks and corners into spots of beauty, spending several weeks here superintending the work. Three carloads of shrubbery were secured at the Valdesian Nurseries of Bostic. Mr. Padgett was forty-five years old the day before he died. He leaves a wife and five children and one brother to mourn their loss. Our town has lost one of its best citizens. Mr. Padgett was a man of quiet unassuming mien, a Christian gentleman in the true sense of the word. He seemed to realize that his days were few from the first of his illness and said he was ready and waiting to go. We deeply sympathise with the sorrowing family and his host of friends. A new machine has been installed in the mill for drawing the warps for the looms. It is a wonderful machine which seems to operate with almost human intelligence. Mrs. Dora Cumnock, of Spartanburg, took charge of the Girls Home Monday. Mrs. Cumnock needs no introduction to the people of Cliffside. She at one time conducted the Cliffside Hotel and has many friends here, who will gladly welcome her back to our town again. 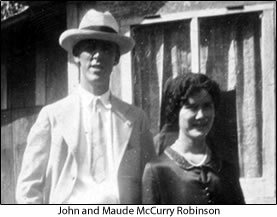 (On July 8) Mrs. Dora Cumnock has returned to her home in Spartanburg, after conducting the Suitsus Cottage for some time. She will be succeeded by Mrs. Ollie Harris. Quite a number of out-of-town visitors attended the millinery opening of the Cliffside Mills Store last Thursday. It was reported that the cars of Messrs. Z.0. Jenkins and Joe Lattimore of Henrietta were “held up” on the road, about half way between Cliffside and Henrietta, but it is a mistake. It was reported that several Negroes, about twenty-five in number, were on the road near High Shoals and as most of the ladies were afraid to start several cars were quickly on the way to the place, but when the men arrived at the spot where the men were supposed to be, they found no one there. The Cliffside Renown Band was scheduled to give a concert at the park Sunday afternoon at two-thirty but on account of the rain they gathered on the balcony of the Cliffside Mills office and rendered some good music which was enjoyed by a large crowd who took shelter under the awnings of the stores and library building. The band is progressing under the able leadership of director D.C. Cole. The American Legion which was organized here several weeks ago, now has fifty-one members. Our people were grieved to hear last Saturday morning of the death of Dr. C.B. Wiseman which occurred at his home in North Henrietta Friday night. A large concourse of people attended the funeral Sunday afternoon at High Shoals. The Cliffside train made a trip to accommodate the people who could not get other means of conveyance and even the baggage coach was filled. Some estimated the number of people at the funeral at five to six thousand. We feel that the county has lost one of its most efficient and consecrated physicians in the death of Dr. Wiseman, and his friends all over the county and elsewhere deeply sympathize with his bereft family. Mr. Andy Goode, Jr. had the misfortune to have his car wrecked late Sunday night. He lost control of his car as he neared the bridge across the creek at the rear of the Methodist church, the car went over the high embankment and was badly wrecked. Mr. Goode saved himself by leaping from the car just as it went over. Mr. A.L. George lectured to a large crowd on the square Sunday evening at 5:30. Mr. George was once convicted of the crime of murder and sentenced to be hung, but a few hours before the time for the execution his sentence was commuted to life imprisonment. After serving several years the real murderer confessed his crime and Mr. George was exonerated and set at liberty. Since that time he has been most of the time-on the road lecturing. Mr. Robert Hawkins who is stationed at Camp Morrison, Va., stopped over here Saturday night on his way from Atlanta, Ga., where he had carried some military Prisoners. The swimming pool was teeming with boys Saturday. It’s a fine place to spend a part of the hot days we are having now. People all over town, and some from the outside are going to the deep well in Goforth Flat for sulphur water. The well is five hundred feet and eleven inches deep, and is very strong with sulphur. The water will be analyzed soon. A good stream pours out the top of the well all the time without force pump. Mr. John Robinson rode his horse out to where a lot of men were at work here Monday and while standing there watching the men his horse dropped dead. Master Charles Carpenter, who had the misfortune to have his leg broken several days ago was removed from the hospital at East Avondale Sunday to the Presbyterian hospital at Charlotte for an operation. He was accompanied by his father Mr. J.P. Carpenter and brother Mr. Ed Carpenter and Dr. Bobo Scruggs. Mr. Romie Dedmond had the misfortune to break his arm last week trying to crank a Ford. This is the second accident of this kind to occur here recently. Mr. Barney Davidson underwent an operation at the hospital at East Avondale last week for appendicitis, and is reported to be getting along fine. While the continued rains of the past several weeks has interfered considerably with construction work on the new dormitory for girls, it is hoped to have the building ready for occupancy by the latter part of October. The Cliffside graded school opened Monday morning with the largest attendance in the history of the school. There were three hundred fourteen pupils present, seventy-nine more than the first day last year. The high school department is under the management of Prof. Chas. C. Erwin, who was superintendent of Huntersville High School last year. There were eighteen enrolled this morning in the High School Department and there will be others. A department for teaching domestic science will be added. Miss Della Carden will have charge of the classes in vocal and piano music. 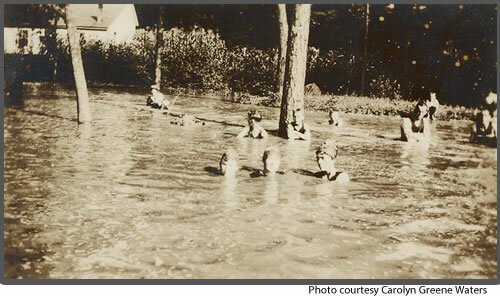 Miss Carden returned from her home in Andersonville last Thursday and spent the week end with Miss Nora Freeman. Miss Carden will have a number of pupils who are not in the school also. Mrs. A. Koch went to the hospital at East Avondale Monday for an operation, having her tonsils removed. We hope for her a speedy recovery. The State Board of Health conducted a tonsils and adenoid clinic for the children of Cliffside and Avondale.Forty-six school children were successfully operated upon, for the removal of tonsils and adenoids, by the State Board of Health’s club plan for school children. The clinic was held at the Avondale Community Hospital. Dr. F.B. Scruggs, the skillful surgeon of Cliffside, was employed by the Board of Health to perform the operations. Drs. J.R. Shull and A.C. Duncan administered the ether. The clinic closed Thursday, September 30. All children who were treated during the clinic were able to return to their homes the following day. The people of Cliffside and Avondale are grateful to the State Board of Health for the great work done for them. The same opportunity will be given to the remaining schools of Rutherford County about the last week in November. What is said to be the largest shoe in the world will be on display at the Cliffside Mills Store, the 25th, 26th and 27th, Thursday, Friday and Saturday of this week. It is a “Star Brand” and is estimated to fit a man fifty feet high weighing one and a quarter tons. Some man! Someone said they thought it the first car load of a pair ordered for a Cliffside man, but we can’t vouch for that. The store will be closed Thursday for Thanksgiving after ten o’clock Thursday morning. From the Courier’s “Cliffside News” pages in 1922. The young people of Cliffside are very anxious for the new theatre to he completed. Perhaps some of the older ones are in the same frame of mind. The theatre is on the first floor of the R.R. Haynes Memorial Building. The seats are being installed and in a few days we will have one of the best equipped and handsomest theatres in this section. The new theatre will open this week. The first picture will be shown Tuesday night. “The Fall of Babylon” has been booked for an early date, and many other good pictures. The new theatre opened to the public for the first time last night. It has a seating capacity of 417. The building was pretty well filled. 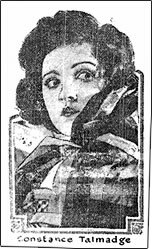 Constance Talmadge, one of the Stars showing in “The Fall of Babylon,” showing at the magnificent Cliffside Theatre, Friday and Saturday, April 21 and 22. Though a very good year for Cliffside Mills, 1920 must have been, for the average resident of Cliffside, a very mixed bag. 1920 saw the cost of clothing rise so rapidly that throughout the country “overall clubs” were formed by men in order to combat the high price of clothing. Bib overalls were the perfect garment for mill work, with pockets for everything a man would need: pen and pencil, tools, keys, watch, notepad, wallet, change purse, knife, tobacco. 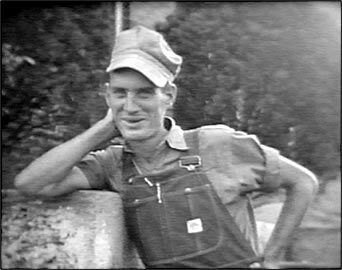 This is Fred Scruggs in Cliffside in 1937. The idea of course was to buy, and wear, overalls, which could be purchased very cheaply – usually for very little more than one dollar. Politicians, naturally, tried to reap some benefit from this situation. Senator Nat Dial of South Carolina gave a speech on the potency of “overalls” and “calico aprons” (for women) and then posed in his office in a denim outfit. He declared that there were too many $25 hats and not enough liberty bonds. But in North Carolina, Governor Bickett declared, when asked, that he would not affiliate with the overall organization being formed by the federal and railroad employees at Raleigh. He further suggested overall club members not buy an automobile until prices dropped by 25%. Excerpted from Cliffside, North Carolina: The First Half Century by Donald F. Bailey. Photo is a frame from the 1937 Cliffside film by H. Lee Waters.